The Los Angeles Lakers are organically tanking. Or maybe they’re just plain tanking. Lakers second-year guard D’Angelo Russell will be out between 1-2 weeks after an MRI taken on Saturday showed a mild MCL sprain, strained right calf and a bone bruise. The Lakers had already ruled him out for Sunday’s road game against the Dallas Mavericks and also did not travel with the team. Though Russell underwent an MRI on Saturday morning, the results did not become available until later in the evening. The Lakers’ initial timetable has Russell missing anywhere between the next 3-6 games, though they plan to reevaluate him in a week. This clearly isn’t a good thing for the Lakers. Developing the youth is a priority, and having Russell miss what could end up being three to six weeks, or more, in the long run is disingenuous to what they are trying to do. 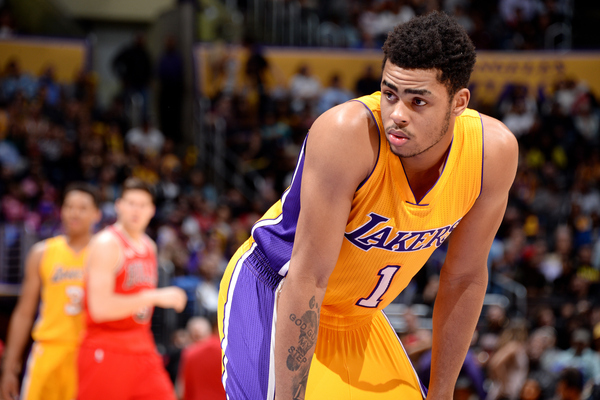 At the same time, they have Jordan Clarkson, Nick Young and Lou Williams to pick up the slack. Larry Nance Jr. and Luol Deng are both healthy now, too. Equally important, the Lakers aren’t exactly chasing wins. Look no further than their 49-point loss to the Dallas Mavericks on Sunday to see that. The Philadelphia 76ers will get their pick if it lands outside the top three, and the Lakers will be forced to send their 2019 first-rounder to the Orlando Magic if this year’s selection conveys to Philly. So they have two first-rounders on the line this season; it makes sense for them to pursue losses under the guise that they are rebuilding. Right now, they are on pace to keep said picks. They have the third-worst record in the league. If they’re looking to increase their odds, though, they’ll have to hope one or both of the Brooklyn Nets and Miami Heat get hot. Less than five games separate them from the league-worst Nets, while they’re dead even with Heat. Losses are, for the rest of this season, the Lakers’ best friend.